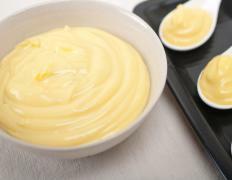 Some instant puddings have a rich custard-like consistency. Instant pudding is a pudding mix which comes in powdered form designed for quick and easy use. When warm milk or water is added to the powder, components of the powder — usually gelatin or tetrasodium pyrophosphate — react with the liquid, allowing the pudding to set rapidly. Several companies make instant pudding in a wide range of flavors, and most markets carry it. Many of these companies also make sugar-free versions of their pudding, allowing individuals who are sensitive to sugar to enjoy their products. It is also, of course, possible to make pudding from scratch. Depending on the type of pudding one wants to make, this can be almost as easy as making instant pudding, or it can be more difficult. In either case, pudding is usually served cold, so after it is made and poured into molds, it needs to be chilled for a minimum of one hour. Homemade pudding usually requires a longer chilling time, and it may need to be delicately handled to prevent it from liquefying. One of the earliest versions of instant pudding was JELL-O® brand pudding, a popular global brand today. The first patent for a gelatin dessert was filed in 1845, although the fruit flavored gelatin closely associated with JELL-O® didn't appear until 1897. Early versions still required housewives to deal with sheet gelatin, a sticky, messy, and sometimes smelly process. When pre-gelatinzed starch was developed, truly instant pudding was born, since it could be made quickly and with a minimum of fuss. Some instant pudding is designed to turn out like a rich custard. Common flavors for custard include vanilla, chocolate, coconut, and butterscotch. Others are clear flavored jellies; many of these jellies are fruit flavored, although the JELL-O company did at one point have chocolate flavored jelly. For custards, cooks usually use milk for a rich, filling flavor, while jellies are made with water. In both instances, cooks can add inclusions like pieces of fruit for additional texture. There are a number of uses for this pudding. Some people enjoy it plain, either unmolded or scooped from pudding cups. The pudding can also be used to make fillings and frostings for desserts, and some people make savory versions with sugar-free instant pudding. What Are the Different Types of Pudding Desserts? Crispety-I have also tried the sugar free vanilla instant pudding and it tasted great. The only difference is that the sugar free instant pudding ingredients contained Splenda which actually tastes like sugar. You can also bake an instant pudding cake. What you do is bake the cake like you normally do and then in the middle you place a layer of chilled instant pudding on top of the lower layer. This way when the cake is ready you will taste the instant pudding filling. You also coat the rest of the cake like you would the way you add frosting. It will have a light airy taste like a Boston crème pie. SurfNturf- Yum that sounds so good. I think that instant pudding desserts are fun to make because they take so little time. You can even combine two instant pudding mix flavor combinations and create a swirl in a sundae glass. Another thing you can go is layer the instant vanilla pudding and alternate it with some Cool Whip in between. It not only tastes good but it really looks great. You can also garnish the top with chocolate chips, cherries, and whip cream. I love instant pudding pie is so easy to make; I just love it. All you need is some Jello instant pudding and a Ready Crust pie crust that you can buy in the supermarket. You can use an instant banana pudding mix and add the milk and pour it on a stovetop. Once it thickens you pour in onto the pie crust and put in the refrigerator to cool for a few hours. You should also slice some bananas on top for garnish and you can also sprinkle some coconut shavings on the top. If you are trying to lose weight, you can substitute the regular instant pudding mix with a sugar free version and use low fat graham crackers for the crust. This is an easy dessert that is low in calories when done this way.